As a wedding photographer, you can pose, you can light, you can direct anything you want. 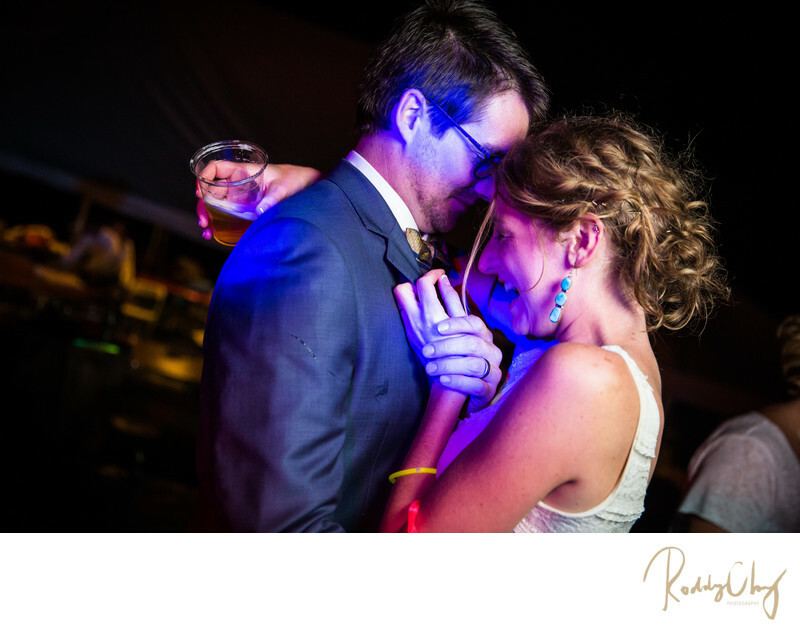 But nothing is more rewarding and important than capturing the most candid moment between the couple. And this image absolutely demonstrates it. It was towards the end of the dance reception at the Big House Lodge when everyone was drunk and lost out of control (in a good way). Everyone had some type of alcohol in their hands, so did the bride Abigail. To be able to capture a moment like this, I believe sometimes you just gotta be prepared, keep shooting, and hope for the best. Because you never know when it's going to happen. Thanks to my assistant who was holding my speedlite with a portable soft box and just a grip handle the whole time. I was able to wait for the moment and just click the shutter without having to worry about the position and the direction of the lighting. And back then I did not have a monopod purchased yet, so my assistant had to hold the light modifier up high and over time her arms would get extremely sore. And I thanked her a million times for that! This was the 2nd wedding I had ever shot in my career. And I couldn't be more proud of what I was able to create and preserve those moments for the bride and groom. The raw emotion, the tears, the joy, the mood at night along with the celebration among everybody all make this photograph so irreplaceable. Up until this day. Abigail and James' wedding is still one of my favorite weddings of all time. Keywords: Big House Lodge (3), Cle Elum (3), dance (9).